Imperfectly Painted: Way-Cool Mani Wednesday: All the Flakies! Metallic color shifting flakies are my current jam. 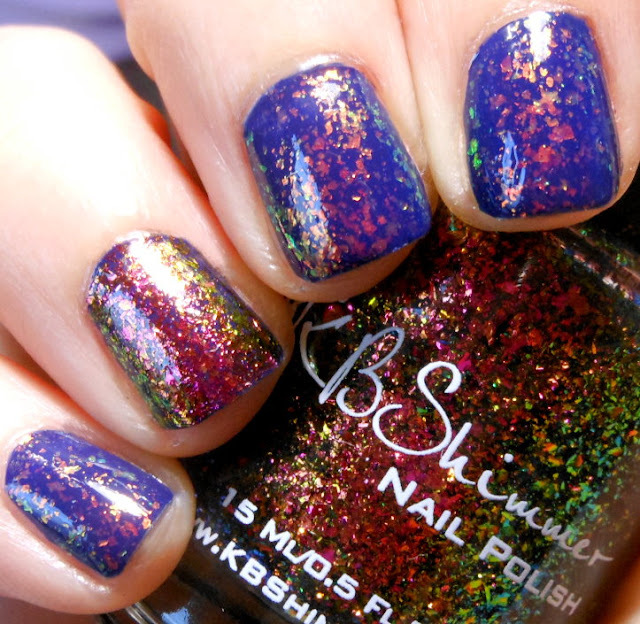 I swear once I'd seen it all in nail polish, these flakies came around. My favorite so far are hands down, KBShimmer's. I think those have the best formula and cover completely in 3 coats. You can see my review of those here. Anyways, I've been having fun playing with flakies on different manis. I haven't forgot about those translucent flakies either like Essie Shine of the Times. This mani I did recently I used both types of flakies. Polishes Used: Orly La Playa, topped with Essie Shine of the Times, with a KBShimmer Take the Punny and Run accent. Gorgeous combination! I really need to pick up some of these flakies!! I actually think its super helpful to see the comparison of the metallic next to the translucent flakies. Similar but not quite. Was that one coat or two of Take the Punny and Run? I love flakies so this is right up my alley! I'm glad you found it helpful. That was two coats of Take the Punny and Run.